Here’s a simple but surprisingly fun app. NxtApp is aptly named. Your job is simply to solve the next number in a sequence of numbers. The app classifies the sequences as Add or Subtract, Multiply or Divide, Powers, and combinations of the previous categories. As a Pre-Calculus teacher, I feel like my students should be pretty comfortable with concepts like arithmetic and geometric sequences as well as simple sequences generated by quadratic equations before they ever make it to my class (at least informally). Unfortunately, I have found this is not usually the case. If I ask what the next number in the sequence 0, 3, 8, 15, … is, I usually just get blank stares. NxtApp is designed to polish just that kind of skill. 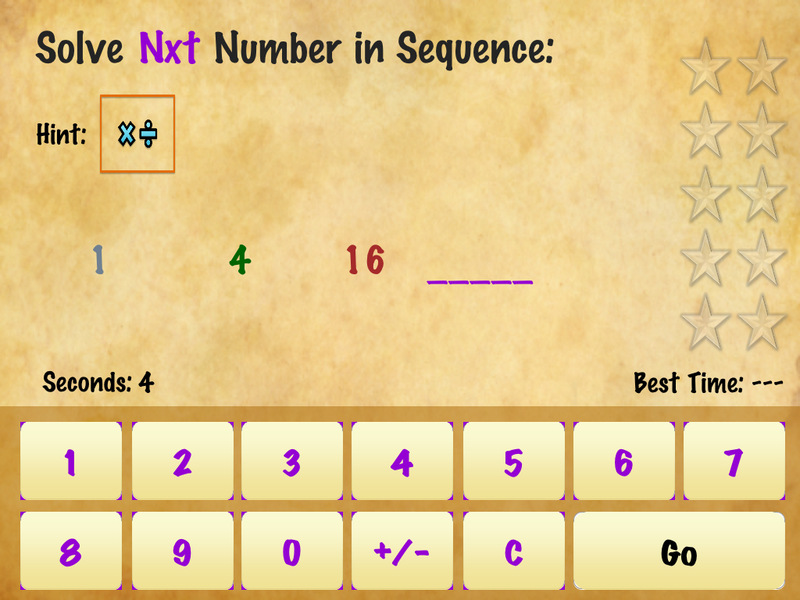 To play NxtApp, you just figure out what number comes next in the sequence to get points and try to improve your time for rounds. The challenge level is high enough on some levels that I definitely found myself having to think for more than a couple of seconds to be able to solve the problems mentally. In the end, it’s a pretty simple app; there’s not too much to it. But it is a fun way to practice these skills, and for $.99, it’s not going to break your budget.